Recent comment in the public domain which has formed part of a sustained attack on the work of the Tribunal, has rendered it necessary, in order to assert the integrity of the Tribunal, to clarify a number of matters. 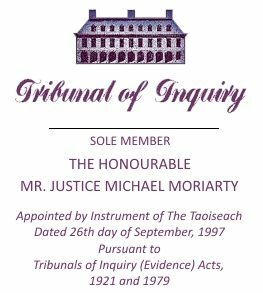 For the absolute avoidance of doubt, it is not permissible for me, and it is no part of my purpose, to engage in media debate with any person, in relation to any of the criticisms which have been made of the good faith of the Tribunal, and of members of the Tribunal legal team. The sole purpose of this unprecedented Statement is to make clear that I have to date endeavoured to discharge my remit to the best of my ability, in accordance with the Oath of Office which I took when I was appointed a Judge of the High Court. I wish to make it clear that none of these criticisms will interfere with the impartial discharge of my remit; nor will they deflect me from ensuring that fair procedures are adhered to in bringing my work to conclusion; and nor will they inhibit me from reporting, without fear or favour. My Report will be based solely on evidence heard at public sittings of the Tribunal, and not on unsworn speculation or allegations, from whatever source.